My bologna has a first name. It's L-A-D-ee-Y. LadyLinoleum has a way with B-O-L-O-G-N-A. Enter the Olive Loaf Shawl...In all of it's knitted AND crocheted glory! I know what yer thinkin': She's lost it completely. First intarsia meat on a crocheted grill, then weenie links about the neck, now this! What's left? Oh now, don't you worry your pretty little heads 'bout that because there is oh so much more lurking 'round the dark recesses of my gray matter. Muhahahaha! Though, I must state for the record that I rather enjoy entering my LYS and asking the proprietors for bologna colored yarn. Their reaction? Priceless. Anyhow, after sufficiently torturing the poor people behind the counter at my LYS with such a question, I made the decision to knit this shawl as opposed to crocheting it because I find that knitted fabric drapes better. Second, I needed to decide whether to add the olive slices into the piece using intarsia or to add them on later as appliques. 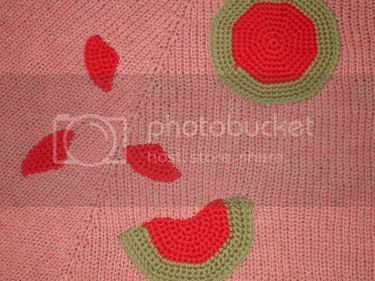 After a bit of back and forth I chose to applique the olive elements for two reasons: (i) I did not want to see the wrong side of the intarsia on the shawl and (ii) I wanted the olive slices to have a three-dimensional quality. So in the end, I chose to crochet (more dimensionality than knitting and no dpns needed) the olives and sew them on later. To finish off this wearable half slice of yarn-based bologna luuv, I crocheted a skin along the outer edge. Ta-Da! Bologna Couture. Yes. It. Is. Needles: Size 9, 40" circ. Another meaty yet fashionable accessory for Project Wrongway! Copyright 2006 Regina Rioux Gonzalez. All rights reserved. Oh wow. I love it! truly disturbing for the vegan in me, but i love it. yeah. really. ohhh, spam pants, with a little mustard and brown sugar...there was a day I'd have worn the hell outta those! There are few things in life that make me heave at the mere mention of them. Olive loaf is one of them, but this is awesome! ok but can you do head cheese?? that is the best looking olive loaf i've ever laid eyes on! I vote for a spam-can purse. Hahahahaha that is toooo much fun. It looks really good and wowsa you knit as fast as you crochet ;) Is everything gonna be meat-related... or will other food groups get in on the linoleum fun? I love it, it is way cool woman! I love it! You're so much fun, Regina! Oh. My. God. That's awesome! Well done. Awesome as well as tasty. i would love it if more people would come in to the LYS i work in and ask for things like balogna colored yarn. i have helped someone choose yarn to replicate bacon. that was fun! i love your stuff. awesome. You are such a breath a fresh, but slightly processed meat-scented, air. Both choices on the knitting and crochet were right on. Intarsia would have made the olives just look like spots. But now on your shawl, like the loaf itself, the olives look somewhat out of place on there. Perfection. You're going to let me wear this on my date tonight, yes? Oh I'm having nostalgic flashbacks...school lunches in a Miss Piggy lunchbox LOL Love it! AWESOME! That looks so neat! WTG! I want to be in the front row of the Project Wrongway Fashion Show so I can throw some meat tenderizing flakes at the models! I love it! I can't wait to see what you come up with next. OMG. So brilliant. I'll admit though that my vegarian eyes first saw a gigantic slice of watermelon. Mmmmm...watermelon. it could have a pimento stuffed olive hat!!! It's perfect - and I KNOW you can come up with more food-inspired goodness! that's a slice of olive loaf... now where is that giant bag of wonder bread?!? your shawl is too cool... i love it! i can't wait to see what is next! Simply delightful and de-lovely. Must share with my equally fiber obsessed sister. The applique was right on; it looks like you could almost sit there and pluck the olive and pimento right out. Love it. After reading your first line I actually WAS thinking "What's next, Spam Leg Warmers?" No, really! Honsetly, I have much desire to try this one. Keep On Knittin'! Seriously, that is awesome. Shawls are such a serious business. I love your joie di vive. or are you a vegean living vicariously thru yarn???? ahhhh...somebody stole my head cheese joke...anyway It's uh...hmmm...it's something! 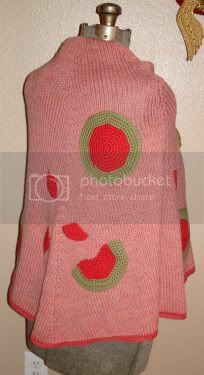 To what occasion does one wear a bologna shawl? So...have you shown your meaty creations to those women in your LYS? I'd love to see their reaction on the finished product of the "bologna colored yarn". Regina--you've done it again! And you know combining knit and crochet as all the rage... great job! regina, whilst i HATE olive loaf, but do love bologna (my unamerican parents never bought it) and i love love love the red tape around the outside. whilst it is very obviously olive loaf, it is also gorgeous in an abstract way. i would love to see you make some abstract wearables. and yes i am in to do a pippi longstocking project with you. crazy ones! I so love this shawl. You wouldn't happen to be thinking about writing a pattern for this one? I absolutely love bologna and am so glad to find that I am not alone! Peace to bologna lovers everywhere. Time for another sandwich, peace out. Time to get started on your 2014 holiday gifts! 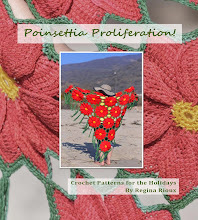 Crochet Wings Pattern Now Available!